Do you know what is MUCH better than Turkey leftovers?? ..... is Scriptus 2017 Ink leftovers !!!! HA HA!!!! BauerInks.ca has acquired the few leftovers of the Limited Edition, totally Exclusive Ink for Scriptus Toronto Pen Show 2017 !! 150 Confederation Brown is now being offered to the international community!!... Coordinate with your friends and get multiple bottles, international shipping will be at cost. I wish my financial situation was different right now. I can't justify at this time. Edited by Runnin_Ute, 16 November 2017 - 00:07. Finally received my 2 bottles that I asked a friend who lives in Toronto to pick up. 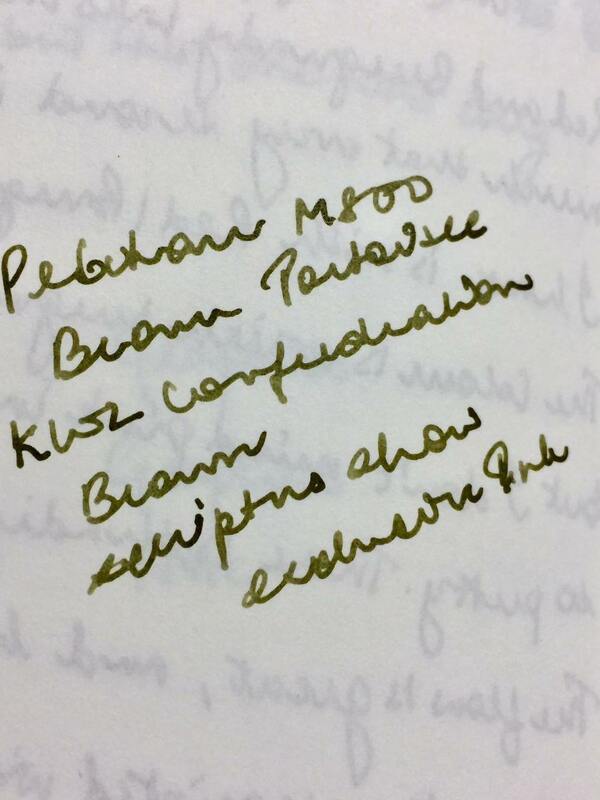 I am getting a tasteless pale green out of a firehose Pelikan F nib on all papers I tried it on. It's not as lubricating and free flowing as I expected it to be, and saturation is low too. Totally not worth the effort I went through to get it. Have you tried using a dip pen or dipping a nib to eliminate flow issues or water in feed ? I tried it with 2 pens, both cleaned 2 and 3 weeks ago respectively and flow was great with the previous inks used. I tried multiple papers: Graphilo, Tomoe River (both variants), Tsubame and copy paper. Conid Monarch Titanium F nib - tuned to a 9/10 flow. I have absolutely no idea what is wrong with it. I opened both of my bottles and filled pens from both. Still a tasteless, disgusting and pale green. I had to check mine after reading this, and so I filled an Edison Mina that has a medium nib with this ink. The pen is quite a wet writer, and there are some Sailor inks I can't use well with it. The flow in my simple test was fine. This nib was "Binderized" by Linda Kennedy of Indy-Pen-Dance so it's going to be a smooth writer. I didn't see any problems in my admittedly simple test. The ink as I'm able to see it in the artificial light (it's night!) is green, not brown. It's somewhat similar in color in this light to Sailor Style Dee Delta Doujima Ryokkin, but not as greyed as that ink, and Sailor Hougado Pen Gallery Uranari Green, but with more brown. 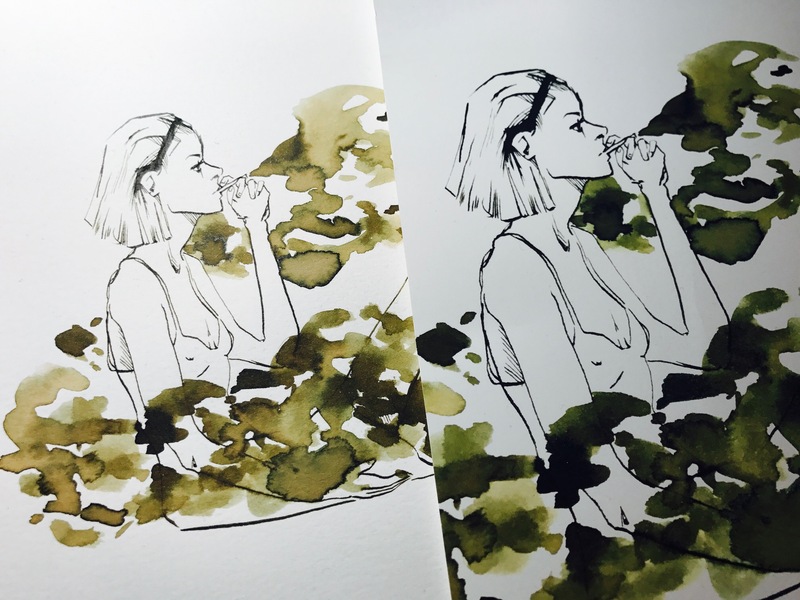 The value (light-dark) of the ink seems similar to these inks.On the Mohawk via Linen paper (an absorbent paper) there really wasn't any shading. Perhaps a dryer pen would bring that out? I don't know. 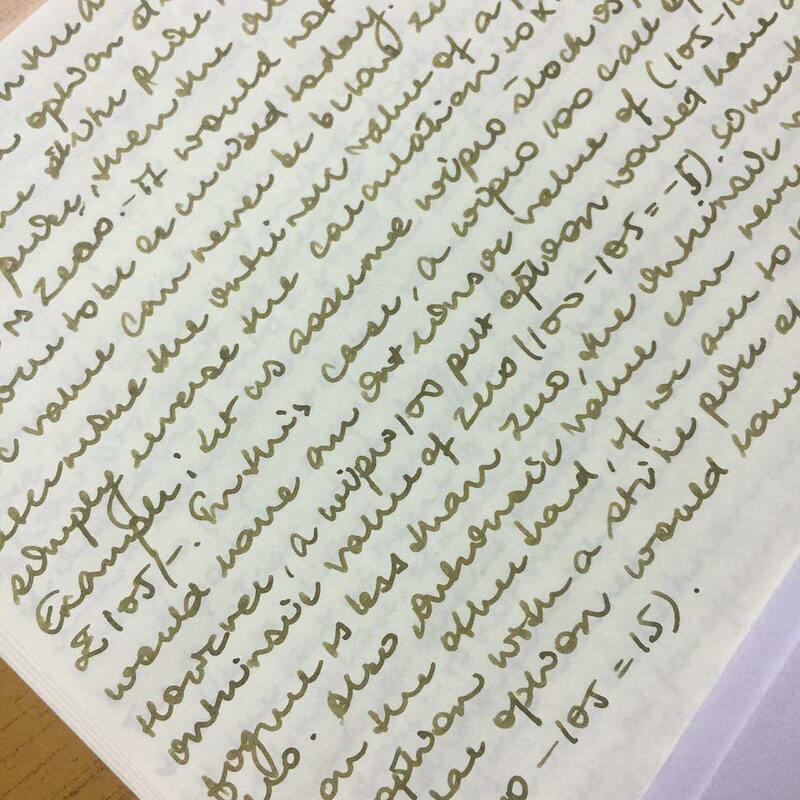 On the vintage notebook paper I have (a sized paper) the color varies slightly. I'd have to play with it more to see. There is no sheen on either paper, but the Mohawk almost never shows sheen, while the KWZ Warsaw Dreaming sheens on the vintage notebook paper. I'll have to take some pics tomorrow in better light. And work with the ink some more. I currently am getting a green ink. There are other greens that I have bottles of that I don't like because of their color. So far, that's not true here, but we'll see how it looks over time. Not to knock Mew's experience, but mine so far isn't as negative as that. I got one of the extra bottles left over from the show, and mine is definitely greenish in appearance, but depending on paper, dries to a browner shade. It's quite close to what I see in the images/the color of the label. I wonder if something might have happened to yours during transit (stored in the wrong conditions or something?) because it seems odd that a few bottles out of presumably the same batch would have such a difference in appearance. Yep. Mew. That looks a lot like mine. Im so sorry you're disappointed. Edited by Tas, 27 December 2017 - 09:29. I was expecting a brown green shade like in Lgsoltek's review but got this. Disappointing, but whatever. I'll stick to sailor. Edit: Btw, no need to apologise Tas, it is what it is. I expected something else, what was in the reviews. Edited by Mew, 27 December 2017 - 13:24. Mew, Im seeing the same with my bottle that was left over from the show. I suppose I was expecting something a bit more brown. But itll work. However, I wont be needing the second bottle I purchased...if anyones interested. I asked a friend who lives in Toronto to pick up the bottles. Leftovers weren't something that I expected. I'll probably not use this ink again, the shade is not to my liking, at all. The ink that appeared green under fluorescent light last night appears more brown in natural light this morning. I'll be posting a review soon. I'm not sure how the ink will appear tonight under the light, or whether some change has taken place overnight. I know my pens probably aren't as wet as Mew's, but fairly wet. I can see how the color might be divisive, some will call it a "fallen leaf brown" others "pond scum green" depending on pen, paper, lighting, and each person's unique vision. Edit: I'm going to add that compared to brown inks this appears definitely "green" while compared to green ink it shows its "brown" side. Edited by white_lotus, 27 December 2017 - 15:50. I used a rather wet flex nib in my review. I think that made the colour darker. 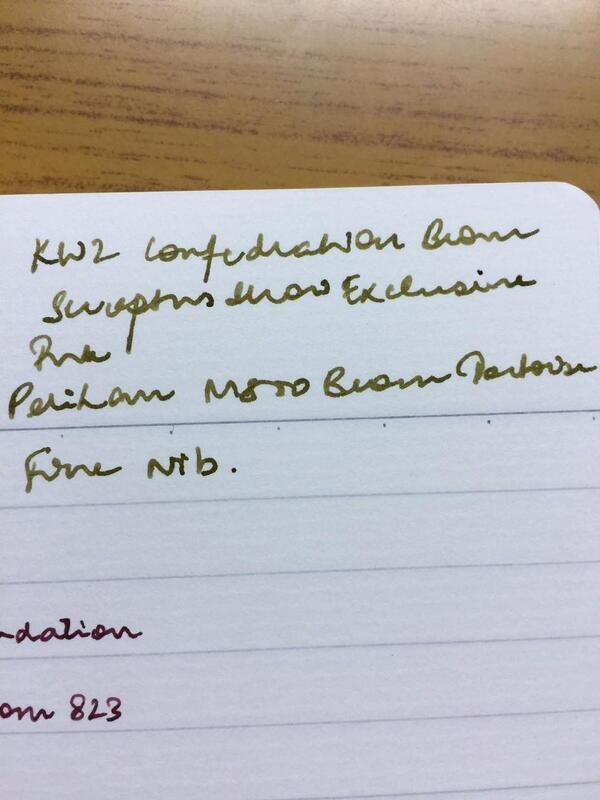 Also the ink is really paper and nib dependent, and it's exactly this variation that I love about it. Hello Everyone... HAPPY NEW YEAR!!!... . I was away for the Holidays... first I got sick just before the Holidays .. and after I had family visiting, reason why I haven't been here much.. (or at all)... Hope everyone had a GREAT HOLIDAY with family!! Wanted to post this pic, to show the colour difference you can see over time. Confederation Brown is very paper dependent, the picture below shows the Art created on Bristol paper (on the left side) and the picture taken of the same art. Time difference is approx a few days. The picture was taken when the art was still fresh (10 minutes or so) and the comparison pic was taken days later. And yes... if you compare to browns, it looks green, compare to green and it looks browner. That's how the name came along. I was trying to design a green ink, out of 10-20 samples of green hues.. this was the only one that caught my eye (because of its murkiness) and in comparison it looks quite brown. Konrad and I played with this hue a tad more (original was too dark), until we got a shading one. Most greens/browns don't have sheen, this one has a silvery halo on some papers. In any case... I don't ever expect everyone to love my colour choices.. I appreciate you gave it a try on different papers and pens. I actually love that about this ink, I have it in three pens (different nibs and flows) and it looks like three different inks. Firstly, a very Happy New Year to everyone. In yours, Lgsoltek's and the one done by Tas. That's why I asked my friend to drop by the show and pick up as many bottles as she could. She got 2. No ink is worth doing this for, even if it sailor, let alone KWZ. So this should take care of whether I like the hue or not. Now, I tried the ink with 3 pens. 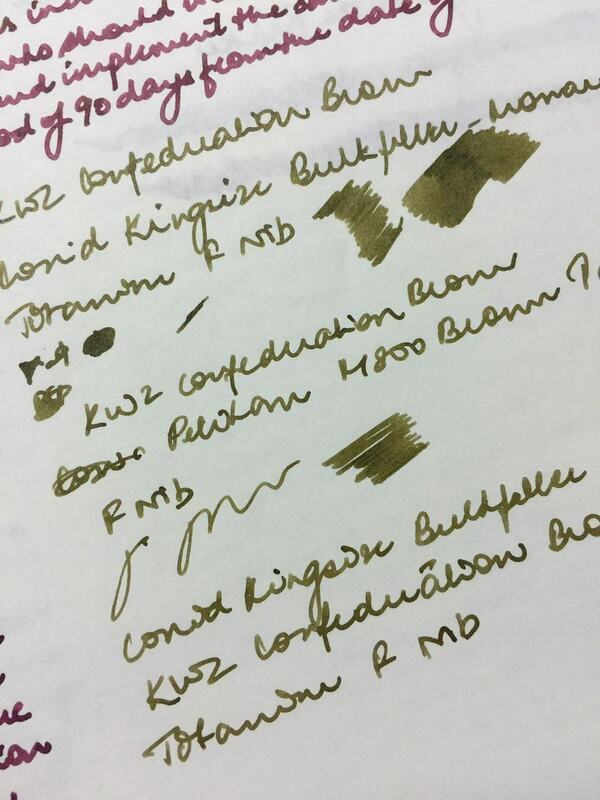 M1000 F, Conid Kingsize F, and M800 F. With each and every single pen I got a tasteless, disgusting, pale green. It was more like Shousaikan Shinzen rather than In the Cigar colour range which I was expecting. I tried it on 4 papers above, and a few more after that. Pale green, every single time. The pens I used are no dry writers. Pelikans are the wettest writers after flex nibs, and F on my M1000 has enough gap between the tines to pass another pen through it. Getting to lubrication, saturation etc. I have tried your northern twilight. This confederation is like herbin compared to that, too thin. And northern twilight wasn't that great to begin with. It was okay, maybe good too, but not great. Neither is this as wet and well lubricated as northern twilight. Difference is less noticeable with Conid and M1000. They are very wet and dry/wetness and Lubrication of the ink aren't as noticeable as with my other pens. It doesn't change colours either. My writing samples from a few days ago are still as pale as they were when I wrote them. It doesn't change it's colour from paper to paper and pen to pen either. It's remarkably consistent, consistently pale green. I have no interest in ink art. I just want something that would write well and give me what I bought it for. I don't do flex writing, neither am I interested in drawing, or learning fancy scripts.